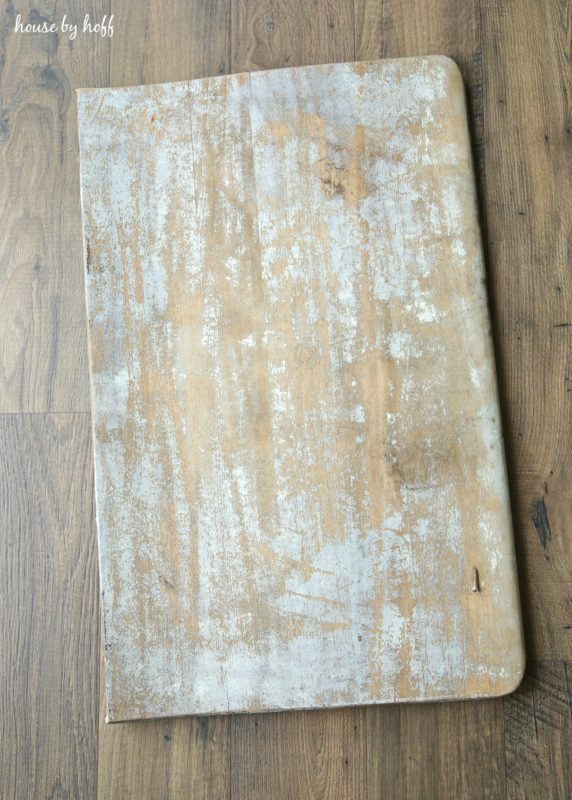 This board was part of the bench of the old school desk. You can see it was a perfect, chippy, old piece of wood. The kind that is just perfect for a sign! Even more perfect that I didn’t have to do an ounce of prep work to it! I love the big, swoopy calligraphy and the simplicity of the words on the old piece of wood. Do you have any fun fall projects on your list? 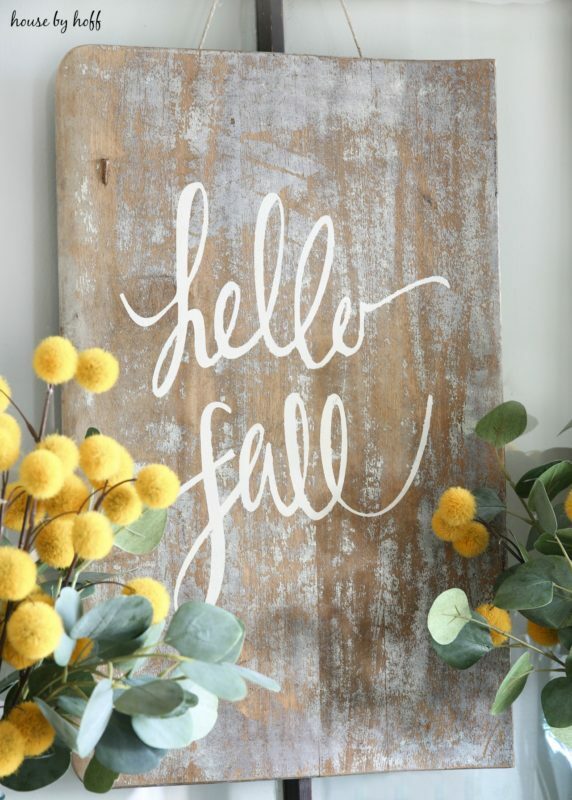 If you like this fall sign, maybe you’ll enjoy this quick round-up of some of my other DIY signs! I love the sign so much! Where did you get your entry table? It is awesome! Do you recall what the table was called or who it is made by? Did you purchase it recently? Hi!! This is gorgeous! 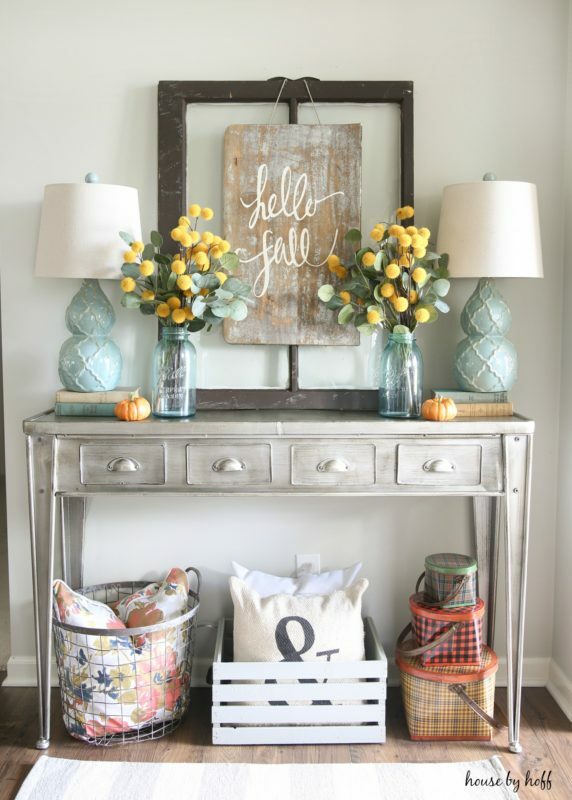 Do you happen to know the name of the Wayfair entry table? Thanks! Love it April! So pretty and what a great re-use! 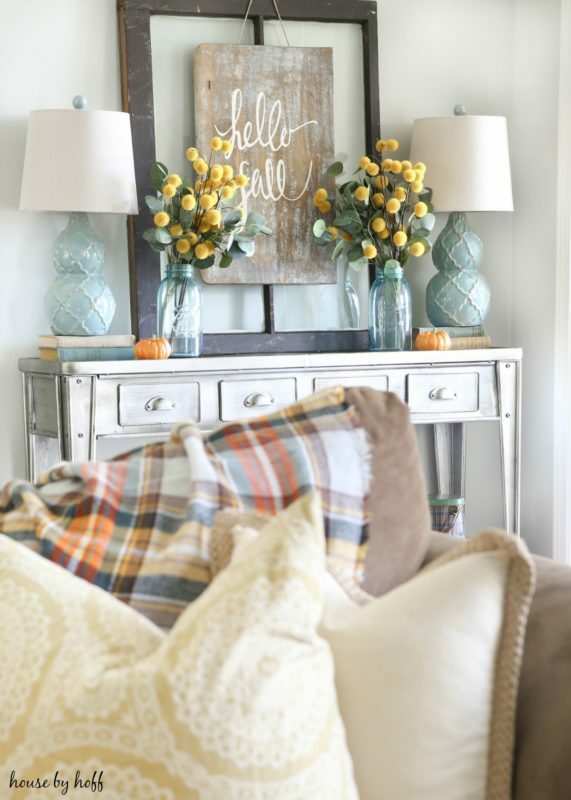 Love the sign and the whole vignette! The patina on the wood for the sign–dreamy! Thank you, Becky! Isn’t it dreamy? Love all of it! What kind of flowers did you use? I looked at a couple stores and couldn’t find them. The sign is perfect. Where did you get the greenery? I have the yellow balls but I need something to soften them up. Love this decoration. This is really a great idea for fall. It’s beautiful April! And styled perfectly! I always have loved old school desks but don’t have the room for one! This is such a great idea to still use the top! Where did you get those lamps?! They’re amazing! Could you post the brand of the lamps or any other information? I absolutely love them but it’s been so long, I doubt Marshall’s will still have any! I’ve checked over the lamps, and there really isn’t anything else distinguishable that I could tell you about them…There isn’t a brand name or anything. Sorry! 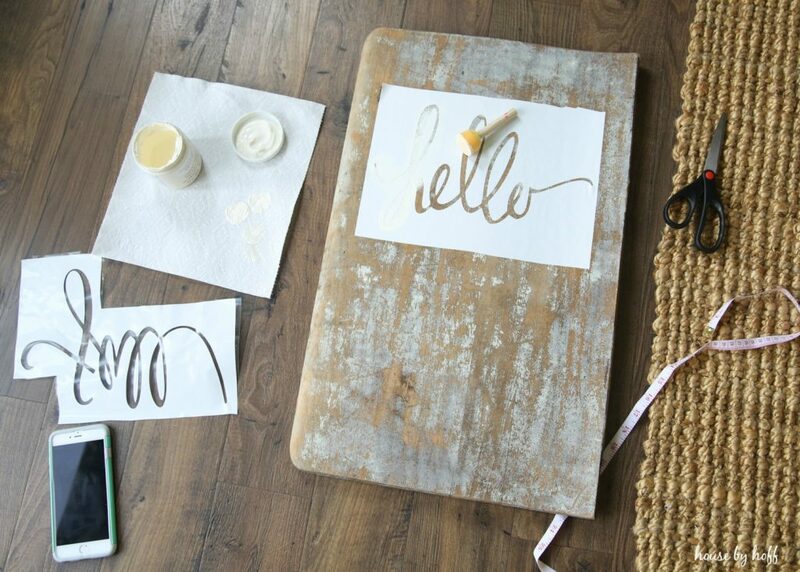 Love this decor project, the way you recycle old school desk become fall sign is really good. I love this sign! I’ve been using my Silhouette to make lots of signs lately, too. So cool that you found an old desk that you could use. I’ll have to look for that design in the Silhouette store. So cute! Love this! Where did you get the window frame from? Where is the cute pillow on the bottom left from? What is your wall color in that room? Thank you for your tutorial. Very nice work and set up! I found your site through my cousin. She wants me to recreate this sign. 😀 I told her that would be tough as I don’t have an old school desk. But I will try my best to make it look like one! Ugh. 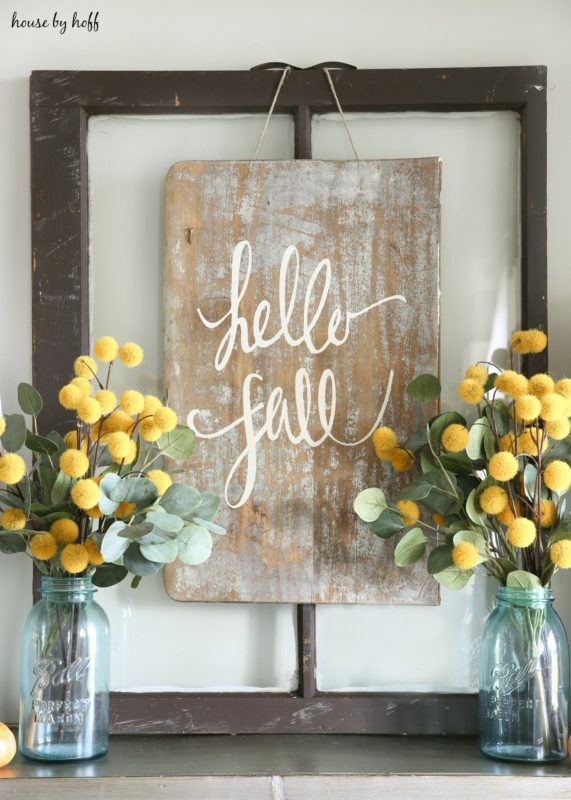 I’m wondering if you could share the font name of the “Hello Fall”? Gotcha! I’ll have to check on that. Thank you so much for getting back to me so quick April. 🙂 Keep up the great work on your blog. Very nice!